If Wodehouse were starting out today, he could expect to have a fair portion of his work flung back at him on these grounds alone. The busy modern publisher would read no further than: “The sunshine of a fair Spring morning fell graciously upon London town” (Something Fresh). Or “Sunshine pierced the haze that enveloped London” (Heavy Weather). I can hear the clicking tongues already. Today, entire novels are rejected due to opening lines like these. We have to be instantly gripped. “But half a jiffy. I’m forgetting that you haven’t the foggiest what all this is about. It so often pans out that way when you begin a story. you whizz off the mark all pep and ginger, like a mettlesome charger going into its routine, and the next thing you know, the customers are up on their hind legs, yelling for footnotes. 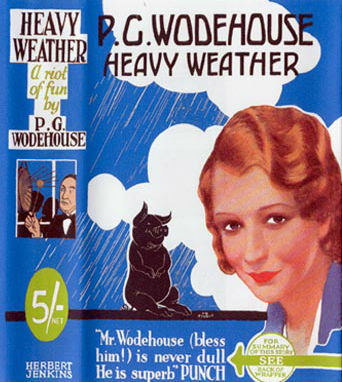 Wodehouse fares very well on this score. Indeed, his dialogue is so snappy that he writes long passages without so much as a ‘said’ in sight, perhaps a legacy of his time in the theatre. ” ‘I say, Bertie,’ he said, after a pause of about an hour and a quarter. Wodehouse does break the rule of never using alternatives to said: “‘Croquet!’ He gulped” in The Clicking of Cuthbert; “ ‘Am I a serf?’ demanded Evangeline” in Mulliner Nights; ” ‘Go away, boy!’ he boomed” (the Duke of Dunstable) in Service with a Smile. But such transgressions are rare. According to the rules for writing fiction: ‘”To use an adverb this way (or almost any way) is a mortal sin.” Again, Wodehouse breaks the rule of never using an adverb in his dialogue, but examples are hard to come by:”‘I suppose you know who did it, hey?’ he said satirically” (Service with a Smile). This is the Duke of Dunstable again. What was it about Dunstable, arguably Wodehouse’s foulest creation, that caused such reckless use of verbs and adverbs? The incorrect use of exclamation marks is a modern misdemeanour that we would not expect Wodehouse to commit. Nor does he. Mostly we find them in his dialogue: an occasional ‘Darling!’ here, a justified ‘What ho!’ there. Every so often, he throws caution to the wind and has a character exclaim: ‘Am I mortified! I’m as mad as a wet hen.’ Or: ‘Lord-love-a-duck!’ (both from Money in the Bank). Regarding the use of exclamation marks, the rule is: “You are allowed no more than two or three per 100,000 words of prose.” Wodehouse certainly exceeds this quota. It’s only natural that, when his plots reach their feverish high points, his characters feel the urge to exclaim things. But Wodehouse never misuses or overuses exclamations, and they fit seamlessly into the text. How sad that this perfectly useful punctuation mark has come to be considered a hallmark of poor writing. Does the word suddenly leap out at you in that passage? Does it make the editor in you itch for your red pen? Is it poor writing? I’ve no doubt the many commas and sub-clauses will make our more sluggish-minded readers’ eyes water. It’s just lack of practice. Too much Hemingway in your diet. Not enough Wodehouse. Wodehouse breaks this rule often, from the slang of the Drones Club to his gangs of New York. Some of these attempts are more successful than others. “Well, you will after dis!” said Mr. Crocker, happily inspired. Ogden was eyeing him with sudden suspicion. Wodehouse continues to use this particular dialect throughout his writing career, and many of the examples defy ‘the rules’. None of these are detailed descriptions – Wodehouse drew his characters lightly – but it’s fair to say that he goes beyond the cursory mention of head-wear, so admired by the Hemingway school. Avoid description. Avoid adverbs. Is this advice for novel-writers or twitter users? According to ‘the rules’: “You don’t want descriptions that bring the action, the flow of the story, to a standstill.” It’s all about action. I pity the reader who turns to modern literature as an escape from the stress and anxiety of modern life, when we writers seem intent on keeping them in this state of tension. A fine beginning, an enjoyable description – no mention of the weather. It isn’t clear from ‘the rules’ how much description is too much, but Wodehouse judges this for himself and gets it just right for his audience and purpose. In my case, I would begin by skipping the complete works of Hemingway. But where does this leave our assessment of Wodehouse, according to the modern rules? The answer is, of course, that it hardly matters. Wodehouse is an acknowledged master of his craft and has nothing to prove, in spite of changing fashions about what constitutes ‘good writing’. On reflection, my argument has is less to do with Wodehouse than ‘the rules’ themselves. If Wodehouse, one of our great writers who remains well-loved more than a century after he began writing, doesn’t fit the modern rule book, are editors, publishers and critics closing their minds to other potentially great writers who don’t fit them either? “My parents died in a thunderstorm!” she cried suddenly. This piece on the topic of ‘good writing’ was written for my P.G. Wodehouse blog. I think it’s not so much about good writing as about what sells, and for the latter Mr Leonard’s rules tend to be spot on at present. I don’t think any of messrs Dickens, Verne, Wells, Doyle or Mrs Christie would have had great success if they tried to publish for the first time today, nor even Hemingway or Steinbeck. Tastes constantly change and these “rules” will probably be invalid before too long. Of course no one can predict if changes will be for better or for worse next time; we might find ourselves longing for writing that adheres even to these rules. Yes – all good points. It is a case of what’s in fashion, and fashion can always change for the worse. It was the ten rules piece that prompted my thinking. I’ve spent some time agonising over drafts trying to correct my work to improve it, and I do seriously consider this kind of advice for writers. It’s the idea that there is one formula for good writing that I find hard to swallow. Or even the idea that readers are a unified body who want the same things. As you say, tastes vary. My favourite rule, though I can’t remember who’d said it: Learn the rules, so that you can know when to break them. I’ve read debut novels that became overnight bestsellers that break every single rule there is. But you need to know what you’re doing to pull that off. I always write better when I’ve been reading Wodehouse. It flows well, and we always know what he means don’t we. Love your blog, keep up the good work…. Thanks so much Susan. I think Wodehouse puts me in the mood for writing as well. It’s as if I’ve had a personal pep talk. Lovely, laugh out loud piece and I am so sorry about your parents too! How very nice to read something so well written itself! Keep up the good work – it’s very much appreciated. What Ho Victoria. Thanks for your lovely comment. It’s wonderful to be part of the wide Wodehouse world. Ashok is in India, I’m Australian, and there seem to be Wodehouse fans just about everywhere. I have great fun writing the blog, and I’m looking forward to having a peek at yours too. One way to identify an epic from the rest is perhaps the extent to which the author goes to describe the weather, the setting and the ambience, often linking all these to the mood of the main protagonist. Wodehouse also does this, to great effect. Sunshine, flowers, bees, ants….all get to play a role in his inimitable style. The hint you get is pretty clear – this is not a two-minute noodle; what is getting dished up is a delectable fare, to be relished and savoured at leisure.Something to curl up with in bed, with a tissue restorative on your side and possibly a soothing symphony playing in the background! Absolutely so! Nothing overdone — just little touches of sunshine. Right, ho! May I re-blog this one? Leaders break the rules with aplomb. Famous authors also do it all the time. They have the courage of conviction to think out-of-box in matters of themes they choose, the structure of the narrative they come up with, or the language as well as expressions they use. P G Wodehouse is no exception. Literary agents of today, upon receiving one of his manuscripts, might end up twiddling their delicate thumbs and deciding to junk it without any remorse, thereby depriving us of some delightful stuff. Here is a highly illuminating post on this subject from the inimitable Honoria Plum. This is just wonderful Honoria – and your ending was superb! Thanks so much. I had great fun with it. Absolutely! I might use that line myself. And thanks so much for the kind words. Can anybody help me to write it into Standard English? Psmith, The Journalist. Thank you in advance. I’m glad Plum grew out of “dialect” writing, something which was quite fashionable before WWI, especially in America. It’s quite tiresome in the hands of someone who isn’t Mark Twain or O. Henry or Damon Runyan. Wodehouse’s best “dialect” writing is his toned-down Bertie and the Drones dialogue. Jeeves, of course, has a dialect all of his own. Having said all that, I have to confess that I love CJ Dennis (for non-Australians, his Songs of a Sentimental Bloke are well worth looking up). By the way, your ending to this great piece is perfect and worthy of the Great Man himself, he said enviously in a cloud of despond . . . oh hell, I can’t do better. Toodle-pip! I agree with all of that Noel. 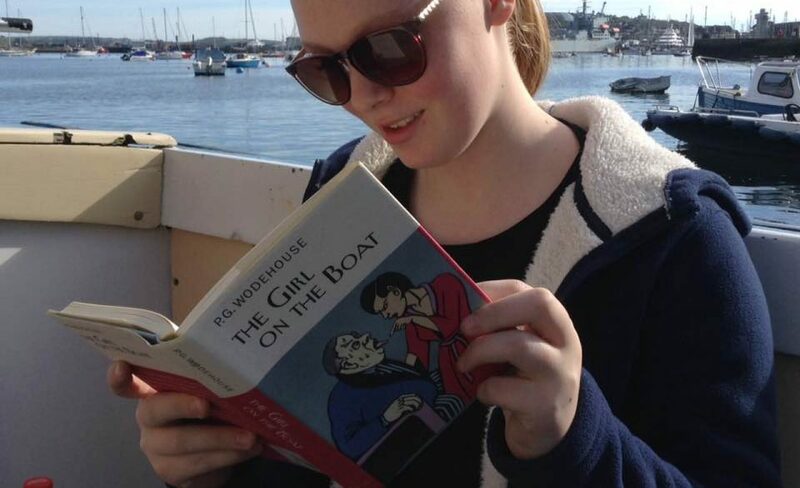 I think Wodehouse must have too, because he used it sparingly in the years to follow. C.J. Dennis is a fabulous recommendation also. What a splendid article. I can hardly wait to read your novel – weather reports included!